I've only made ice cream once so far this summer, but with all the egg yolks I keep getting from my macaron experiments, I hope I can make some more soon. Having just opened a bottle of marsala, I wanted to try this zabaglione gelato from my favorite ice cream book: The Perfect Scoop by David Lebovitz. I loved it, especially with fresh strawberries, but my ungrateful husband thought it tasted too alcoholic and even compared it to the old alcopop Hooper's Hooch! Suffice to say, I finished it myself. Pour the cream into a large bowl and place a sieve on top. Mix milk, sugar, salt and lemon zest in a sauce pan and warm until the sugar has dissolved. Beat the egg yolks in a bowl. While whisking, slowly add the warm milk mixture. When everything is mixed, pour it back into the saucepan, and gently heat until the mixture thickens. It will take a few minutes on medium heat and you have to stir it the whole time. Pour the creamy mixture through the sieve and into the cream. Mix well, and add the marsala. Place to cool completely, preferrably in the fridge over night. Run in an ice cream machine according to instructions - mine took about 25 minutes. Scrape into a container and keep in the freezer. can i use heavy cream instead of the double cream? (to be honest, i don even know wat double cream is) and can i use other kinds of alcoholic drinks for this? Double cream, heavy cream - it's all the same. Just different in each country. Here, it's really called whipping cream, but apparently that's sweetened in some countries - ours is not. Look for something with a fat content around 35-40% and you should be fine. I haven't tried it with any other alcoholic drink, but as long as it has the same alcohol level as marsala - that is, fortified wine - it should work. 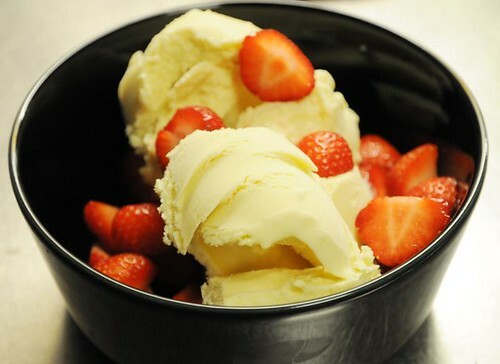 I LOVE zabaglione with a passion but have never thought of it being made into an ice cream!! Hum, might be good, especially with berries-yum! I'm sure your 'ungrateful' hubby will redeem himself later:) Mine usually does:) Hope your little one is doing well!